When night falls, danger unfolds at the uMkhuze Game Reserve. And while some of the world’s most deadly predators—ranging in size from hyenas to lions—coexist next to African elephants, giraffes, and more within this massive, 140 square mile natural area, they aren’t the only creatures out hunting at night. This particular section of the iSimangaliso Wetland Park in KwaZulu-Natal, South Africa plays host to one of the country’s most profitable, albeit illegal, industries: poaching. In Africa, it’s a $70 billion business. Organized crime rings dabbling in poaching often carry ties to other smuggling industries like narcotics and weapons; some even connect with terrorist organizations. In this specific target area, rhinos most often land in the criminal crosshairs, with over 3,800 killed in South Africa alone over the past seven years. Their horns allegedly sell for $65,000 per kilogram as poachers look to profit from ivory and rhino horn powder. On the evening of November 4, 2014, two poaching suspects entered the reserve. One carried a .458 caliber rifle outfitted with a silencer. A cane knife—a long, machete-like tool used for harvesting—may have also been involved. Nearly 80 rhinos had been poached already that year; more seemed destined for the tally. But by chance, four park rangers noticed suspicious movement while on foot patrol that evening. A firefight ensued. “[Poachers] are prepared to shoot and kill whoever stands between them and a rhino horn,” Dr. Bandile Mkhize, the CEO of the company running the reserve, told the Zulu Observer one day later. Luckily, in this encounter, the rangers (and rhinos) survived. “We do not encourage the killing of poachers,” Mkhize said. “But at times our rangers are left with no choice as they defend themselves from these criminals who obviously do not value human life.” Throughout 2014, authorities had already arrested 50 suspected poachers and recovered 40 firearms. In 2015, the war between wild life protectors and poachers continues to be both bloody and expensive. It’s littered with similar (sometimes worse) incidents, and it requires investment in things like manned-aerial vehicles to supplement overmatched eyes on the ground. With such a complicated mess, it all sounds a bit like a war—so maybe it’s no surprise that the most recent hope for a breakthrough comes from computer technology honed on an actual battlefield. The US Department of Defense spent billions of dollars during the wars in Iraq and Afghanistan trying to prevent deaths caused by improvised explosive devices (IEDs), and one successful solution used a combination of mapping and big data to predict the most likely spots for attacks. That way, such areas could be surveyed with unmanned aircraft—aka drones. Today, this combination has made it south, and it’s being applied to stopping the poaching of Africa’s endangered elephants and rhinos. Working with wildlife reserve rangers in Kenya and South Africa since, UMIACS developed algorithms based on animal tracking data, past poaching incidents, and a collection of other geospatial, weather, and environmental data. Now it can forecast where and when poaching might occur. When paired with drones, this information helps put rangers right where poachers are most likely to show up. 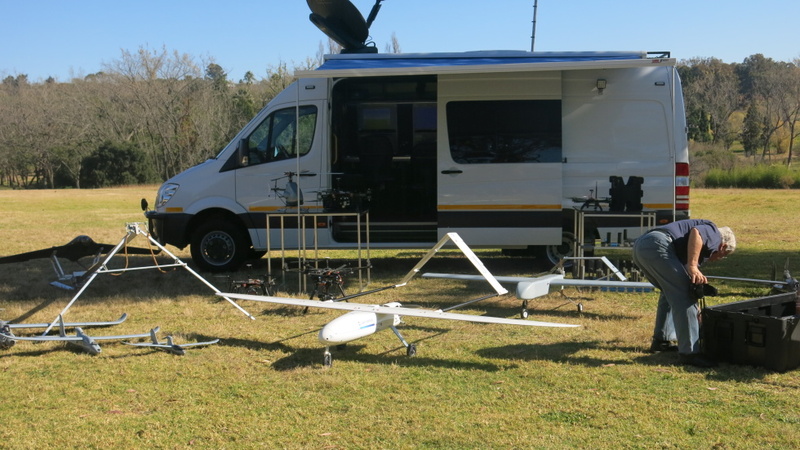 Separately, South African unmanned aerial vehicle manufacturer UAV and Drone Solutions (UDS) has tried testing UMIACS’ software within private reserves in eastern South Africa. To merge those efforts, the Charles A. and Anne Morrow Lindbergh Foundation decided to recruit UMIACS and UDS for a larger program called The Air Shepherd Initiative. This joint project (also involving the Peace Parks Foundation) is trying to raise enough money to train rangers and drone operators at reserves and national parks throughout all of Sub-Saharan East Africa. If they can equip the anti-poaching side with these proven systems, they hope to end the practice and prevent the extinction of certain local elephants and rhinos. Enlarge / The UAV Solutions Talon 120, one of the drones used by UMIACS in testing of the APES system. Previously, many reserve wardens sent out rangers randomly—asking them to guard one side of the park on one night and the opposite side on the next evening. But as anyone who’s researched animal behavior (or read a Bernd Heinrich book or two) can tell you, animals are not very random in their behaviors. Neither are poachers, for that matter. Both act in patterns driven by external influences, so identifying the correlation between those influences—time of day, season, weather, availability of food and water, and even the distance from a park fence—can make it easier to define the probability of both the location of animals and the chances that poachers might come after them. Doing that accurately requires a lot of data, and not all of it is exactly computer-ready. Parks-provided data includes reports of previous poaching incidents, animal tracking collar data, geotagged locations of poacher snares found in the parks, daily reports from the rangers themselves, and information from the safari companies that take tourists out each day to photograph wildlife. “So you’re adding layer upon layer of data onto a satellite image of an area and then asking the algorithms to look at it and explain the variance,” Snitch said. On top of all that, there’s also human intelligence—information about poachers coming from informants in villages bordering reserves and parks. “You can go into the villages and pick out who the poachers are—it’s the guy with the brand new Toyota,” he explained. Given all the factors related to the wild life, predicting poacher behavior feels easier. “In a lot of parks, most of the poaching is done by guys driving up in cars, jumping fences, going in 100 to 200 meters, shooting an animal, and coming back out,” Snitch said. “They are not going 20 kilometers into a park and up a mountainside to find an animal.” UMAICS found one reserve where every poaching incident over a three-year period took place within 160 meters of a road. The reserve measures 100,000 hectares (about 400 square miles) in total. Combing all this, Snitch and the team can improve their most important resource for fighting poachers—the rangers. There is a finite number of rangers in any given reserve, and they consistently navigate difficult terrain in small vehicles that can only move about 20 kilometers per hour. But to prevent poachers from killing the animals they target, the rangers have to be positioned between poacher and prey. Therefore, anything that can help narrow their focus area becomes vital. While the software can put rangers roughly in the right spot, adding unmanned aerial vehicles improves the probability of detecting poachers. If a drone can spot poachers as soon as they enter a reserve, rangers would have enough time to reposition if predictions were off. Snitch said that during tests combining the APE software and drones in Africa, a pattern emerged. “Each time we started flying in an area, the first two or three days there would be a couple of arrests,” he recounted. “But then the poaching in that area would stop.” Part of the reason might have been the deterrent value of the drones themselves, which were demonstrated to local villages to show how people could be spotted without even knowing one was in the air. But the drone hotspots eventually led to strategic positioning of rangers as well. Initially, rangers appeared wary of the drones, afraid they would take away jobs. But when the Air Shepherd team demonstrated how the drones could make ranger life easier—spotting poachers that might be lying in ambush for rangers on patrol or handling the daily job of inspecting perimeter fencing for breachers—they were in. Suddenly technology was saving rangers from hours of meaningless driving around the edges of the park, allowing them to better focus their time. So far, the drones have over 1,000 hours of flying time in testing. At the end of each mission, the geotagged location of animals and humans spotted is sent back to UMIAC’s computer to be added to the data repository to for future analysis. The team continuously searches for variations in trends that might signal changing behaviors. While a number of drone types have been tested by Air Shepherd, Snitch says the preference so far is hand-launched, battery-powered fixed wing drones. These lightweight UAVs can fly for a few hours, and they’re able to charge at the mobile command center UDS purchased. Essentially a small camper van, the vehicle also serves as a drone piloting station while maintaining satellite and radio links. While these drones can be brought in for landing, Snitch said that for precision the operators prefer parachute recovery. In this process, the UAVs drop down quickly, reducing the chances of them being blown into the thorns of an acacia tree. By flying the devices in pairs and quickly swapping out batteries, a UAV team can seemingly cover an area indefinitely. It took a lot of money upfront—UDS joined the project with an initial $2 million investment—but Air Shepherd is hoping to raise another half-million dollars to sustain drone operations in South Africa for a full year. Long term, the goal is to raise up to $7 million to fully fund the operation of up to 11 drone teams in South Africa and other African nations. And as the UMIACS algorithms once hopped from battlefield to reserve, Snitch said he’s already had inquiries about using this drone-data combination in other areas. Unfortunately, most have been less charitable applications. A certain family of Louisiana bayou alligator farmers contacted Snitch; they wanted him to use drones with infrared cameras to detect alligator nests in order to raid the animals for eggs. Snitch politely explained the current FAA prohibition on commercial drone operations and demurred. A Romanian game hunting guide also wanted UMIACS’ software, this time in order to locate mountain sheep. Again, no dice. In fact, because of their habitat and habits, the big animals of Africa may be the only conservation project drones are suited for. “You can’t really fly drones in tropical rain forests or swamps,” Snitch observed. And this one case is certainly demanding enough for now.